In today’s article, we are going to show you how you can search the WooCommerce custom user fields. WooCommerce saves a lot of information about your users as user meta, but usually, we can’t easily search through this data. 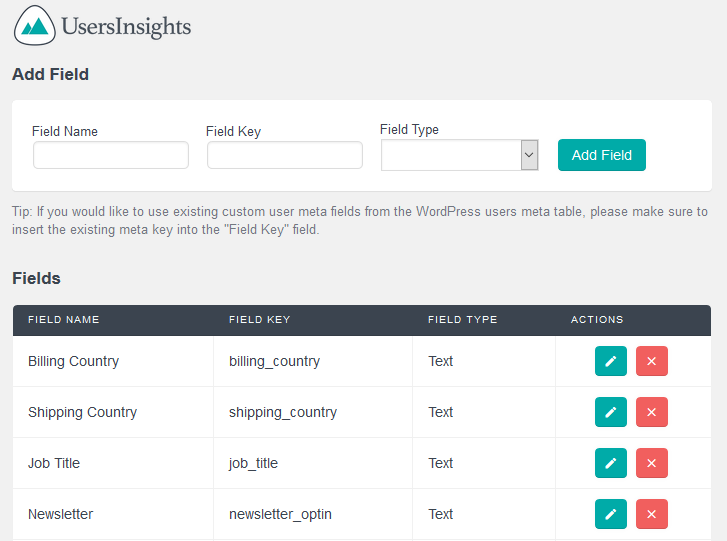 Therefore we’ll use the Users Insights plugin to better understand the WooCommerce data and how to get WooCommerce user meta and the users assigned to these custom fields. Beyond that, our goal today is getting a good understanding of what kind of user meta WooCommerce has. We’ll also perform different user searches and filters, and we’ll see how you can use this information in your WooCommerce store. User meta are custom fields used by plugins and themes to store information about your users. All the information you see in a WooCommerce store has to be stored somehow, and the custom user fields are the best way to store user related data. Therefore, information such as social media address, billing and shipping details, occupation and others are all stored via user meta. These custom fields can be accessed not just by the plugin that created them. So, if WooCommerce stores the shipping address for a user, all other plugins can access that. There’s a wide range of fields at your disposal when you have some WooCommerce users and orders. We’ll focus on the more straightforward and reliable data such as billing and shipping address. You can also create your own custom fields on WooCommerce user registration. We’ll mention how you can use fields added by this method, such as collecting the job title or a newsletter opt-in. There are other fields such as the lifetime value that isn’t as accurate as we’d like. For this reason, we’ll use the Users Insights WooCommerce Lifetime value instead. This field has the same purpose of the default lifetime value but has a much more precise method. You can also load other referenced data, as the orders themselves. We’ll need a bit of custom code to format these fields in a way that we can use them. Nonetheless, it’s a very interesting method of loading user meta, as it allows complex data loading. However, you may want to load other fields as well. You can easily load fields that are stored as user meta just by using the Custom Fields feature and map your fields. You can do that under Users Insights > Custom fields. In this way we can load the WooCommerce user meta fields such as shipping country and billing country. Additionally, if you have other custom fields stored for your users (like checkout form fields or fields stored by other plugins), we can load their data as well. In this example, we are going to load the job title and newsletter registration custom fields that we request in our checkout form. Now it’s time to perform some WooCommerce users custom meta search using all of the fields that we have available. Once you know a little bit your customer base, you may get a feel for where your users are from. But how accurate is your feeling? Let’s put that to test by searching WooCommerce using custom fields for billing and shipping countries. You can compare that with other countries, or if you have a lot of orders from one country you can check which users aren’t from it. This is going to give you an idea of how the other countries are performing. In our case, we have X orders that were made in the US, but were delivered to another country. You can also get WooCommerce user meta and use it to get a better feel of your audience. 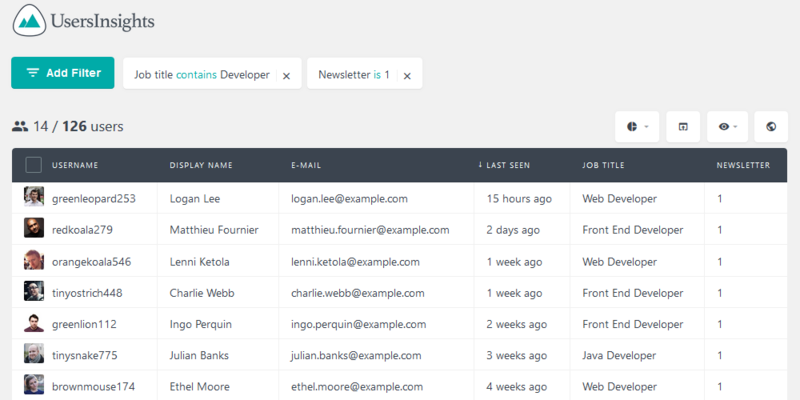 Since we’ve mapped the job title and newsletter opt-in fields we can use them for that. Now that we saw how you can search WooCommerce users using custom fields, let’s see how to do the same with the default fields. In this case, we’ll focus on the data available when you enable the WooCommerce module in Users Insights, regarding orders and lifetime value. Let’s get a feel of our most recent customers by searching for users who have purchased in the last 90 days. Don’t forget that you can export these users. So, after you’ve found some useful information about your users you can click the export button and use the CSV file in an external software. Today we looked into different methods of performing WooCommerce user meta searches. We also discussed the most basic concepts of custom user meta, how they can be used and how you can add your own data. 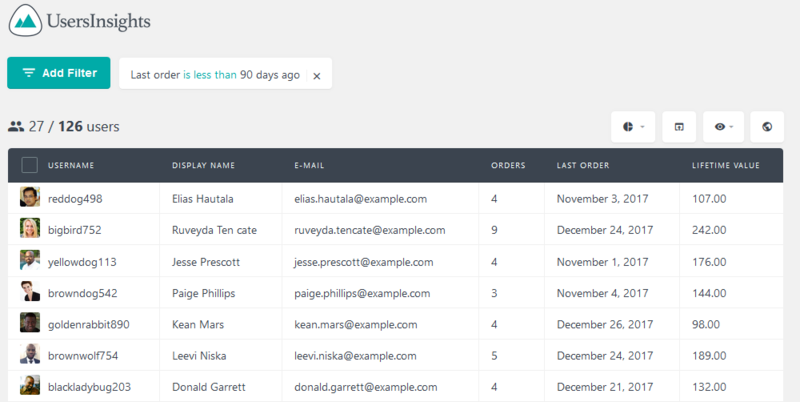 By the end of the day, you should be able to map your WooCommerce user custom fields and search any data you want in your site.